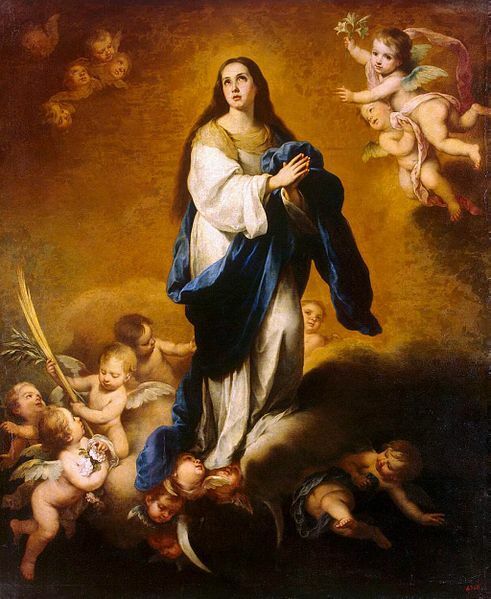 How Scripture Supports The Immaculate Conception. During Gabriel’s visit to Mary, the faithful find scriptural evidence to the Immaculate Conception of Mary—conceived without sin. In regard to this particular scripture passage, the Revised Standard Version carries more theological weight than does the New American Bible translation. In the RSV, Gabriel says, “Hail, full of grace, the Lord is with you!” Whereas in the NAB, Gabriel says, “28 And coming to her, he said, “Hail, favored one! The Lord is with you. The importance of this particular passage is “full of grace,” which comes from the Greek word kecharitomene. The tense of this particular verb form is the perfect passive participle and the message that it conveys doesn’t properly translate into English. As the perfect passive participle indicates something that occurs in the past, present, and future; therefore, what Gabriel is saying to Mary, and Luke is recording, is that Mary is with Grace through all time of her existence—she is without sin. Naturally, this particular passage gives tremendous evidence to the claim of the Catholic Church in support of Mary’s immaculate conception against the objections of our Protestant brothers and sisters in Christ who hold to Sola Scriptura theology. New American Bible, Revised Edition (Washington, DC: The United States Conference of Catholic Bishops, 2011), Lk 1:28. So pray tell, Phillip, why in God’s green earth did the USCCB and the Bishops of the English speaking world approve the use of the New American Bible for our lectionary? It strips the scripture of its Catholic meaning and dumbs down scriptures with inclusive language that is hard to bear at times. The ICEL took that same attitude to their ‘dynamic equivalent’ translation of the Mass in English and we ended up with a Liturgical translation that took about 40+ years for the Vatican to pressure us into our newest translation (and even that is not sufficient in some areas). Now the Pope has turned this over to these same wreckovators to do whatever they wish in that regard in the future without Vatican interference. Sounds like a recipe for total chaos around the world to me. Again, what we can do is pray and have faith in God. After all, He is in control. Don’t forget that God works through individual souls by use of the Holy Spirit. Mary may have the ‘better’ part but without the Martha’s we may find ourselves guilty of sloth. Some of the most contemplative saints in the Catholic Church were moved by their prayer life to do something: found convents, monasteries, confront popes etc. I think we sometimes think that if we sit around quietly and pray that stuff gets done. It is only the beginning. At some point the Holy Spirit is going to ask or give one the fortitude to accomplish something in the name of God. It is the whole premise of the great book, The Soul fo the Apostolate; an apostolate with Christ at its center. True. True. As lay members, we can only influence the greater Church only in certain respects. In my own sphere, I’ve started an adult group dedicated to instructing and discussing our history and scripture. The fruits that have grown out of that is that myself and a couple of other guys are starting a ministry helping the homeless. But in regards to Church hierarchy, the only weapon I really have is prayer, and it’s important not to underestimate that weapon. That is true to a large extent though I used to write a lot of editorials in our diocesan paper and get pretty well known. I had people who heard my name from the owner of a Catholic Shop come over and thank me. The thing is that the paper was read by both the Bishop and all the priests. I had a number of priests who were afraid to speak out come up and thank me as well. Thank You, also note that there is a common objection to this assertion. Well, let’s take a look at the translations. [Acts 6:8] And Stephen, full of grace and fortitude, did great wonders and signs among the people. As we can see, the Greek doesn’t say the same thing. Luke is the other of both works, and only uses kecharitomene one time, so it denotes purpose. Also, note that my classical grammar was a bit off, it’s a perfect passive participle. A Pluperfect, is something that means more than perfect, which is why I of course naturally thought of it with Mary…Freudian slip? I have a question. Since I don’t have a knowledge of Greek, I will concede your interpretation of scripture has merit. However, I am not certain it make logical sense. Here is why. We would expect the mother of Jesus to be special, but would God? Based merely on that text, the proposition that Mary was conceived without sin seems a leap too far. Jesus was without sin, and that apparently is what made it possible for Him to be a fitting sacrifice for our redemption. Yet if Mary could be conceived without sin, then what was the need for God’s Son to be sacrificed for our sins? Because of the virgin birth, Jesus was conceived without sin. How did Mary get to be conceived without sin? The issue, I believe, is that typically non-Catholics/Orthodox come to a conclusion that Mary conceived without sin somehow diminishes Jesus’ salvific action on the cross. I don’t believe that to be the case, I believe that Christ’s death was needed for even Mary’s salvation, so it’s not say that Mary was not in need of a savior, but more or less by God preparing the new Ark of the Covenant, it points more towards the divinity of Christ. Let’s look at the scriptural evidence. Now famously in the Catholic tradition, Thomas Aquinas argues against the Immaculate Conception, largely this was due to the fact that Aquinas, and others during his time, didn’t understand conception and believed the soul to be more aligned with quickening. However, it was Duns Scotus who gave imagery to the above passage. Scotus explained that for most of humanity we have fallen in the ditch of sin, so to speak, and for Mary, God can prevent her specifically for His, by giving notice of the ditch to prevent her from falling. Now, it’s true in Romans 23 that St. Paul writes that all men have sinned, but again, it has to be read in the context of that particular letter which indicates personal, not original sin. For example, the councils of Nicea, Constantinople and Chalcedon really shape the early Christian testimony of the divinity and humanity of Christ. Christ is fully man… but…yet, of course, Romans doesn’t apply to Him. Each of us is different. So each of us sees different issues. I am lousy at design. Not great at original thought. I hate pure mathematics, but I am perfectly happy to take a real world problem and use an equation to solve it. That is, I seem to do fairly well at figuring out how a system works, but heaven would have to help me design a new system. 1. Why is the concept necessary? What purpose does it serve? 2. If Mary could be conceived without sin, and she was not God, then why did the Father need to send His Son? 3. How did Mary get to be conceived without sin? When we discuss such matters, we inevitably find we lack satisfactory answers to lots of questions. That includes questions related to beliefs that are fundamental to the Christian faith. Hence, we each ultimately find it necessary to weigh the evidence and choose. Thus, I can accept the fact that you might choose to believe in The Immaculate Conception, but find it impossible to answer my questions. Since I was raised as a Catholic, I appreciate the reverence for Mary and don’t actually see anything wrong with it. I understand that Catholics revere Mary and other canonized saints, but don’t consider them part of the Trinity. Nevertheless, I prefer to keep my Christian doctrine simple. Why? When a proposition is unneeded and complicates matters, it just gets in the way of trying to understand what we need to understand. Consider that The Immaculate Conception is an idea that separates Catholics and Protestants. To what purpose? Obviously, as the mother of Jesus Mary deserves our respect, but the notion that she was conceived without sin? Although it may be that Mary was conceived without sin, other than speculation we don’t have much evidence. What do we know? Consider Luke 1:31-35. When Mary conceived Jesus, she did so because the Holy Spirit came upon her. Thus, because God had chosen her before time, she was full of grace. Is my approach to this issue better? I am not a theologian. I only know it is part of our nature to consider and examine such things. Studying the works of our Lord is part of our worship, but I doubt God expects us understand the nature of HIs birth. At the Last Judgement, will our belief in The Immaculate Conception much concern Jesus? Probably not. I think we can count upon Him toll ask each of us how much we loved Him and each other. Did we put our faith in God or foolishly choose a worthless idol?